Evan Jeffords is Partner for Kinghorn Insurance Agency, LLC, he is equally ingrained in the insurance business in southern Beaufort County and the Low Country. Evan Jeffords is experienced in both finance and insurance in southern Beaufort County and the Low Country. Originally from Florence, South Carolina. Attended Byrnes Academy where he played golf, football, and basketball. Graduated from the University of South Carolina in 2003 with a double major of finance and management. Worked in the mortgage industry for five years. Joined BB&T/Carswell Insurance in 2008. Evan Jeffords serves on the Board of Directors for the VanLandingham Rotary Club. Member of St. Andrews by the Sea. Outside of the insurance business, Evan enjoys, golf, hunting, fishing, and boating. 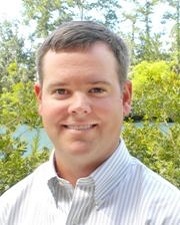 He resides on Hilton Head Island with his wife, Emily, and sons, Tripp and Dawson. Contact Evan Jeffords today at 843.686.3911 or email: ejeffords@kinghornagency.com.